On 19 September 2016, Heads of State and Government from around the world gathered together in the United Nations and adopted the New York Declaration for Refugees and Migrants, a historic document that seeks to address the urgent questions posed to the international community by the growing global phenomenon of large movements of refugees and migrants. The New York Declaration has been adopted in the context of the United Nations Summit for Refugees and Migrants, a one-day event organized by the President of the General Assembly of the United Nations on behalf of Member States, and attended by Heads of State and Government, Ministers, and leaders from the UN System, civil society, private sector, international organizations, and academia, among others. As the document notes, even though humanity has been on the move since earliest times, in today's world we bear witness to an unprecedented level of human mobility. Around the globe, ever-larger number of refugees and migrants are leaving their homes and travelling along dangerous routes. The desperate ordeal often faced by refugees and migrants in large movements, together with the recognition that these movements have political, economic, social, developmental, humanitarian and human rights ramifications that cross all borders, call for global approaches and global solutions. Millions are fleeing armed conflict and the brutal effects of war. Others are escaping violence, persecution, and systematic violations of their human rights. Some are uprooting their lives in response to the adverse effects of climate change and natural disasters. And others still are in search of opportunity. This is a global challenge and humanitarian crisis the likes of which we have never seen before. In 2015, the number of migrants surpassed 244 million, growing at a rate faster than the world's population. There are roughly 65 million forcibly displaced persons, including over 21 million refugees, 3 million asylum seekers and over 40 million internally displaced persons. Over half of the world's refugees are children, most of whom are unable to access education. Women and girls on the move are particularly vulnerable, often suffering the compounding effects of physical insecurity, multiple forms of discrimination, and a lack of access to basic services. Yet the challenge of addressing large movements of refugees and migrants, however great, is not insurmountable if the international community shares responsibility. This time last year, the historic 2030 Agenda for Sustainable Development was adopted, ushering in a new transformative framework for our world. Through our collective pledge to 'leave no one behind', we undertook to ensure that development gains reach our most vulnerable. I have made delivering a universal push towards implementing all 17 of the Sustainable Development Goals, the principle objective of my Presidency of the General Assembly. Implemented effectively, the 2030 Agenda will help to alleviate extreme poverty, sustain peace, increase local opportunity, combat climate change and address many of the root causes driving people from their homes. In the political document subscribed today in New York, Heads of State and Government declared that, in adopting the 2030 Agenda, they recognized clearly the positive contribution made by migrants for inclusive growth and sustainable development. Now we must ensure the needs of refugees and migrants responsible for that positive contribution are not overlooked. In this new document, world leaders express their political will to save lives, protect rights and share responsibility on a global scale, and towards this end make a series of strong commitments to address the issues we face now and to prepare the world for future challenges. 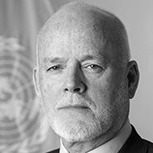 These include commitments to protect the human rights of all refugees and migrants, regardless of status; ensure that all refugee and migrant children are receiving education within a few months of arrival; prevent and respond to sexual and gender-based violence; support those countries rescuing, receiving and hosting large numbers of refugees and migrants; work towards ending the practice of detaining children for the purposes of determining their migration status; strongly condemn xenophobia against refugees and migrants and support a global campaign to counter it; strengthen the positive contributions made by migrants to economic and social development in their host countries; improve the delivery of humanitarian and development assistance to those countries most affected; implement a comprehensive refugee response, based on a new framework; find new homes for all refugees identified by UNHCR as needing resettlement; expand the opportunities for refugees to relocate to other countries; and strengthen the global governance of migration by bringing the International Organization for Migration into the UN system. During my Presidency, I will take forward the commitment of the membership under the New York Declaration to begin a process leading to a Global Compact on Migration, as well as a Global Compact on Refugees. I will also begin to engage on preparations for a successful Intergovernmental Conference on International Migration in 2018. Adopting the New York Declaration is not enough. World leaders and the international community should implement its commitments without delay. Together, we must ensure that no refugee or migrant is left behind.